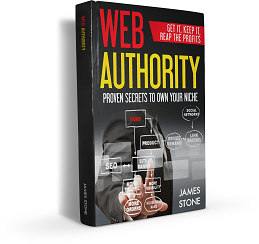 Web Authority by James Stone > Ad Words > Does Webfire Work? This is certainly one of the most significant tools I have come across in a long time. With the keyword phrases getting longer because you can never find anything anymore on a search engine, it’s even more significant to the small time marketer and advertiser. There’s 22 different tools, additional services, and all the training inside. But hear me out, just this one is worth the whole package. What if you could find what I call Google ‘holes’ easily and quickly, find an entire list in minutes? What’s a hole, you ask? It’s a keyword phrase few compete for that has a lot of searches. In other words, there’s a bunch of traffic nobody has claimed. What Webfire does is allow you to enter a keyword phrase for your niche or product, run a utility. It gives you a list of phrases that are not being used by many people in their pages, sites, and seo but there’s plenty of unclaimed traffic. let’s say there’s 1000 hits a week on a particular keyword phrase, but perhaps maybe one or two websites that have used that keyword phrase in the seo work. So, you come along, write an article in your wordpress blog. The keyword phrase Webfire tells you about, you take it, use it for the title, use it a couple times in the body of the post, use it in the tags, and you use it in an All-in-1-SEO plugin. Within a few days, you are definitely place on page 1 for the keyword phrase because there’s nobody else using it. Because it’s a blog post, you manage to get listed in standard Google search and Google blogsearch. How much of that 1000 hits do you think you’ll get? 50%? Not too bad. What if you did this once a week for the next 6 months. How much “FREE” organic search traffic would you be getting off the internet? That’s the power of Webfire. And I didn’t even bother to cover the other 21 tools. I found this article very good,but found the webinar even better. I have always avoided weight loss because of the strong competition. Despite your success in this marketplace I will still avoid it. Some of the niche areas I am working on are less competitive,and by applying your suggestions I am sure I will have great success. Hi John, I have to agree. All these health products, I’ve never done very well. I’ve tried a few. The products are phenomenal usually, much better than you can buy in a store, but they are always of course more pricey, and you have to maintain some kind of purchase every month whether you are doing well or not or they don’t pay. Anyway, with this one, I was given an opportunity on a ground floor, at they top. My upline has no choice but to start putting people under me even if I don’t do much myself. So I thought I’d give it a whirl. I’ve got the product now, been using it for a bit and I like it so far and I am actually losing some weight which has been a struggle. So I’m pleased. Even if the opportunity does not work out, getting healthy again is better still. Thanks for the training you are doing, I am acquiring a NEW skills. AND, what’s really cool, after 38 years in retail, I feel like I can start looking at working from home using those skills you are teaching. Webfire in a NEED TO HAVE tools to be really effective…I’m sold on it…and you! Hi Maurice, excellent. I know, Webfire is ramping up my blog bigtime. I try to teach what’s working for me. You know, do as I say to do? Like in following my own advice. What’s cool is that once in a while, I’m right on.